Flat top bollard cover (sleeves) are made of 1/8" High Density Polyethelyne (HDPE), which is stronger and more fade resistant (guaranteed not to fade for 6 years!) than other products. The color is solid and dense. Unlike some others on the market, you cannot see through it. And it is rigid. We also carry dome top bollard covers in 1/8" and 1/4" wall thickness. These are the Flat Top covers. We also carry Dome Top bollard covers, Decorative Post Covers and Solar Lighted Covers. 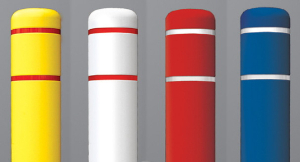 Flat top bollard sleeves are available in a wide range of colors, with or without 2 reflective stripes. Sizes range from 4.5" to 12.75" I.D. (fit posts of 4 to 12.5 inches in diameter in varying heights. All bollard covers (sleeves) can be cut to your requested length at no additional charge. You can order online (for flat top scroll down). However, for orders of 6 or more we recommend that you get a Quick Quote for the best price. We cannot get an accurate freight cost on the website for larger orders. Due to the size of bollard covers, freight is a big part of the cost. For the best price on orders of 6 or more, get a quick quote (usually within 4 business hours) that includes shipping. You can also call.